All I can say is thank goodness I banked a few recipe posts earlier this summer because my inspiration has been pretty dismal during this kitchen reno. Combine that with the dreaded 3rd tri “preggo brain”, and my recipe mojo just isn’t flowing like it normally does. Then there was that disaster of a crock pot recipe I made on the weekend for Eric’s birthday. The pot is still soaking in the laundry tub because when you mess up a slow cooker recipe, you pay the price. I might have to chisel it out. Thankfully, I’ve been sitting on this recipe gem since June. I don’t know how I waited that long to share it because it’s a great one! When I first made these crispy quinoa cakes they disappeared at a record pace. I think I recall eating 5 of them straight from the pan. [Then I made you wait for the recipe for 2 1/2 months! Pure evil.] The next two batches were also quickly enjoyed and made easy meals for us without much fuss. We served them as part of a weekend brunch with home fries and avocado toast, for lunch on top of a salad, and for dinner tossed into a wrap or served with roasted veggies. Oh, and I also love them for a snack, straight from the fridge (yes, cold!) slathered in hummus. So unbelievably satisfying. Crispy quinoa cakes packed with vegetables like kale, sweet potato, sun-dried tomatoes, and more! Enjoy these as part of breakfast, lunch, or dinner. They are great with roasted home fries and avocado toast, on top of a salad, in a wrap, or enjoyed all of their own. It's important to make sure the vegetables are finely chopped for this recipe. If the pieces are too large, the patties won't stick together as well. Recipe inspired by Vegetarian Times . Tips: 1) To cook quinoa, rinse 1 cup uncooked quinoa in a fine mesh strainer. Place quinoa in a medium pot and cover with 1 1/2 cups water. Bring to a low boil, reduce heat to medium-low, and then cover with a tight fitting lid. Simmer covered for 14-17 minutes until most of the water is absorbed and the quinoa is light and fluffy. Remove from heat, fluff with a fork, and then place lid back on to steam for another 4-5 minutes. Note that this makes almost 3 cups of cooked quinoa and you only need 1 1/2 cups for this recipe, so you will have leftover quinoa (which is never a bad thing if you ask me!). 2) To make oat flour, add the oats into a high speed blender and blend on the highest speed until a fine flour forms. You can also use store-bought oat flour if desired. I too recently discovered the quinoa and sweet potato combo (I was missing out) but what I love most about these cakes is the addition of the oil packed sun dried tomatoes….that’s what really packs a punch! Need a snack right now because even if I eat a good breakfast, I’m starving by 10 a.m. and wonder what my problem is?!? I wonder if other people have this issue? And no, I’m not even pregnant, so I don’t have that excuse. But you need healthy snacks like this or I will just hit up a vending machine at work and that is such a bad thing!!! It sounds like you just have a high metabolism, Laura. I have the same problem, especially during times when I’m training for a race or doing extra workouts! Yes, I think a high metabolism is the culprit. I am the same way. I find eating protein and a dose of healthy fats with every meal, including snacks, really helps! We burn through carbohydrates quickly, so make sure to add hummus, avocado, coconut butter, lentil dip, etc. to any grains! Sometimes coffee with breakfast can make you hungry earlier than if you don’t drink coffee. A matcha tea is a good substitute for coffee. I have the same issue, Laura – no matter how big my breakfast is, I’ll be starving mid morning…and my breakfasts are usually very dense. My other issue is that I very rarely feel full. I can just keep eating and eating, especially real food – not snacks like nutbars and stuff, they give me headaches. I find, that if I eat good fats, I can go a bit longer before I feel starved. An avocado makes for a great mid morning snack! The cakes are in the oven now. Didn’t have the tomatoes and darned if I didn’t pick up a package of sun dried yesterday while shopping and changed my mind ( arthritics avoid tomatoes as much as they are amongst our favourite foods, at least in my case ) I used an egg instead and rice flour instead of all purpose – can you believe I have no other flour in my kitchen? My question is do you have a nutritional breakdown got this recipe? I am trying to increase my magnesium potassium and calcium and although I know the kale and yam will help I’m just curious. You can use cronometer.com for this. It’s amazing! You’ll have all the values you need. These look delicious. My mom and sister have celiac disease and cannot tolerate oats, even gluten free ones. Do you have a suggestion to replace the oats? I haven’t tried anything else, so it’s hard to say for sure. Other types of GF flour they can tolerate might work (maybe quinoa or millet flour?) although you’d have to add a little bit at a time until the proper sticky consistency is achieved. Let me know if you try anything out! I just made these and used corn flour instead of gf flour. Worked great! This is an amazing recipe! try quinoa flakes. I have often used them in place of rolled oats in cookies, and I’m sure they would work well in this recipe. this recipe looks really good, Angela! I hope to try it out before the summer is out. Costco sells “quinoa flakes” … its LIKE oats, but quinoa instead. So the recipe might work with that as a substitute? I love the recipe! I’m coeliac as well and can’t tolerate oats. So for flour I used for this recipe corn or rice flour, I think corn starch might work even better. To subsitate the oats: I always have a mix of 2x rice, 1x millet, 1x buckwheat “oats”, that I always use instead of regular oats – on their own, they have quite a, well particular flavour, but as a mix, they work great, e.g. I use them for porridge as well.For this recipe, I didn’t grind them into flour but added them to the quinoa with a bit more water and left the mixture on the shelf for 30ish minutes before adding the other ingredients – worked out very well. Millet oats are the tiniest oats and have a very subtile taste (unlike buckwheat/rice), if you just want to buy one kind take them. Can you freeze these? would you freeze them after cooking? I’m thinking of trying these for my daughter! At 16 months she’s getting pretty picky. Can’t wait to see what recipes you come up with for your little girl! I’m always looking for new ways to sneak in the extra veggies. Hi Allison, Most veggie burgers freeze well, so I would think these would too. I would freeze them after cooking (and cooling) for best results. These quinoa cakes look great! If you’ve been eating out a lot during your renos and need some blog material, I for one would love to hear about what you get when you eat out/order in. Not necessarily specific restaurants, but go-to vegan dishes you know you can rely on. Or, for instance, off menu options you order at “regular” restaurants. I have been a vegan for several years but still have a very hard time figuring out what to get when i go out and end up eating a kale salad. These sound fabulous. Would it be possible to sub ground chia seeds for the flax seeds? And is there anything that would work as a sub for the oat flour? I’m cooking for people with both flax and oat allergies. Ground chia tends to absorb more liquid than ground flax, so you might want to cut the ground chia down to 1-1.5 tablespoons. I think it should be fine though! As for oat replacement, I haven’t tried anything else, so it’s hard to say for sure. Other types of GF flour might work (maybe quinoa or millet flour?) although you’d have to add a little bit at a time until the proper sticky consistency is achieved. Let me know if you try anything out! yes spinach would totally work as a sub! Any type of green you like really. Just be sure it’s finely chopped so the patties stick together. I made them without any greens (can’t have any right now), and they stuck together just fine! Thanks for sharing, I will try out your recipe. Yum! I haven’t made quinoa in a long time! I need to get back onto the bandwagon! Love that these are both bean and nut free! Would anything horrible happen if I left out the sun dried tomatoes? I have everything else on hand so I’d love to make these without needing to wait for a trip to the store! hah ;) They do add a great flavour, but you can certainly leave them out for convenience sake! Or…would one of the lentil or bean “meatball” or “meatloaf” recipes work better for what I’m trying to do, do you think? Oh Quinoa, I love it.. It is such a wonderful thing to eat, incredible healthy and has such a long history..
Will try this recipe the next time! Love from Germany and the -fatcatconnection. Fantastic sounding recipe. Just what I’ve been looking for tot include in picnics for hols next week. How long will they store in the fridge for? These look divine. Thank you for my dinner for tonight. Ack, I hate having to let slow cooker pots soak, they are so huge and get gross! I’m so into these cakes, I have quinoa hanging out in my fridge, so these are happening! I know…I always forget how bad food sticks in them and I always forget to spray with oil! Hrmph. Have you tried baking soda? I looked up “natural oven cleaning” online and found the tip to just wipe it with water, cover it with baking soda, and let it sit for awhile … an hour or so. Later on when you wipe it off, the baked-on crud comes right off! Some kind of chemical reaction, apparently. And if any doesn’t come right off, the baking soda is gently abrasive, so that helps, too. It makes my oven and stove look like new! So now I recommend it to everyone because it makes me happy when baked-on stuff comes off! I’ve used baking soda on the oven but never thought to try it with the slow cooker. I’ll have to try that next time! Thankfully after a 3 day soak it all came off easily…hah. Baking soda also works well with vinegar to unclog/clean sinks; especially on the boat ! PS – just found Quina and Kale; thank you so much for the wonderfully informative recipes ! Oh yum sweet potato quinoa cakes are my favorite but I haven’t made them in way too long. This version looks perfect — I love the addition of tahini. I’ve made the Vegetarian Times recipe a bunch – so so good. I will definitely try your spin on it. Did you try the sauce recipe that came with it? Spicy but good. No I haven’t tried it, but it looks good! These look fabulous! 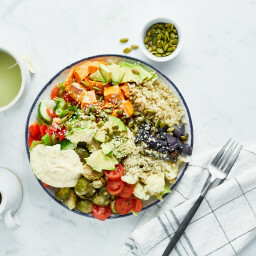 Can you suggest a good substitute for the tahini? Would Sunbutter work? I want to make these but my husband is allergic to sesame. Quinoa and sweet potato what a perfect combination! Lucky you have a lot of plan recipes, a kitchen renovation can be so hectic especially with the baby! I can’t wait to see the updated kitchen! These look amazing! I’ve been looking for more ways to use quinoa! Thanks for giving me yet another recipe to add to my “to make” list! These sound absolutely (and so easy, which is an added bonus)! I can’t wait to make these!! Can you substitute quinoa flour for the other flour? Hi Diane, See my reply about this above – I haven’t tried it, but it might be ok! Hi Angela, thank you for another inspiring recipe! I just love your blog! On a different note – after my own last slow cooker disaster, I covered the pot with bicarbonate of soda (powder) and was v surprised how quickly burnt parts became clean, as if the powder dissolved all the burnt parts. No need for chiseling ;-) Maybe you could try this? Enter the recipe into MyFitnessPal or another recipe analyzer to get a good estimate. This looks delicious! I love all of these ingredients, so I know I would love them all together. Thanks for having such great blog. I have tried many of your recipes in the past, and they are always amazing. Way to go! Wow another great recipe! You are such an inspiration to me. I can’t wait to try it out and see what you have coming up next. Ps. Good luck with the pregnancy – it’ll all be worth it when you hold your bundle of joy for the first time. Yum!! now you’re making me wish I could be in my kitchen :( I still have two weeks of travel food for students to go and I’m not getting enough fruit and veggies!! I’m probably going to make this along with many smoothies as soon as I get home! Not a dumb question at all! For the kale, I believe I measured it after chopping and the basil I measured before chopping. Now that I think about it, I should’ve stuck with one or the other to avoid confusion. So glad to hear it’s not just me that has kitchen disasters. Thanks for being so open and sharing it with us all :). This recipe looks fabulicious! I will so give this a go. Thanks Kimberly! So happy to hear that. Oh and kitchen disasters…it’s a regular thing around here! hah. This looks delicious! I will definitely be making this soon. 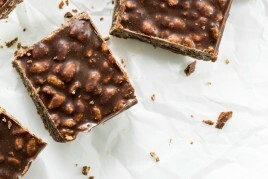 Also, I have a question about one of the recipes from your cookbook – I am going on a road trip tomorrow and I want to make a batch of your classic glo bars, but I’m worried that they will melt in the car. Will your glo bars melt at room temperature when they’re not in the fridge? Please let me know :) Thank you! Oh wow this looks so so sooooo good!! Do you think it’s freezer friendly? Thinking of baking a big batch and just freezing some to have in hand. Thanks!! Ooh I love that you’ve used sundried tomatoes AND sweet potatoes AND greens in these, Ange! They sound fabulous and so full of flavour… and a good thing to snack on while thinking about the best approach for cleaning that crockpot! :) I hope whatever plan B was for Eric’s birthday was a raving success! Can I leave out the all purpose flour, or perhaps use 3 tbsp more oat flour instead? This is such a perfect vegan meal! The all-purpose flour really helps with binding, so I’m not sure oat flour would hold together as well. I used chickpea flour and it held together great! I used millet and that is sticky so my burgers really have holding power now. Has anyone tried buckwheat as I love the taste of that too? They look fantastic and banked recipes are the best…whether it’s hot weather, preggo brain, or whatever the reason for not wanting to be in a hot kitchen, amen for those little gifts from heaven :) Pinned! Those look like the perfect option to take to work for lunch. I am a teacher and just went back to work after summer holiday (International School, where we go Aug-June), and I’ve been brainstorming big batch recipes that freeze well to make on weekends. These are going on my list this weekend. Pinning! I hope you enjoy them Michelle! My family is not vegan, but my sister is. She introduced me to your blog! I just wanted to say, I made these tonight, and they were a huge hit! (especially with my 2 year old!!) My husband usually does the cooking (hes a chef), and he was uber impressed. I did use eggs (we have chickens) and chard instead of kale. Also, I topped them with a tiny bit of goat cheese and a drizzle of EVOO. THEY WERE DIVINE!! I don’t think we’ll be having any leftovers, but I’ll be making these again for sure! Also, what do you think about making these to freeze? We have a vacuum sealer, and should I bake them through and then freeze? or just patty, then freeze, and cook when we’re ready to eat them? Thank you so much for your amazing recipes! I just ate one that I had frozen :) I froze them after baking and I actually think they hold together better after freezing than when they came out of the oven. I wasn’t over impressed when I first made them, but this has made me think twice about them! Hi Angela, these look great and I need to try making them! These look like such a nice dinner. Yum! Before I stumbled over your blog I gave up on burgers altogether. Can’t stand the soy taste/smell. You gave my vegan cooking a whole new meaning! These are definitely going to be cooked over the weekend. Thank you and G-d bless you and your soon to meet baby. Can’t wait to make these! 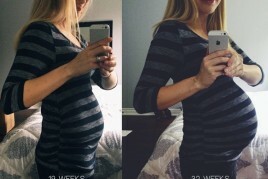 Your baby belly pictures looks awesome! This sound divine !!! I will definitely try these. Yum! These look delicious–love all the different ingredients you have packed in. I bet they taste amazing! Yay! These look amazing! I can imagine that they would be a good case for freezing ahead of time for weekday lunches? Yes I think they will freeze well…like most veggie burgers! Just cook first, then cool completely before wrapping up. Yum! Sunday brunch here I come! I love savory breakfasts (like your savory oatmeal) and finding vegan breakfast ideas that are savory seems to be the only slightly difficult part of becoming vegan for me. Thank you! Great recipe! Is it possible to post the nutritional info? Thanks! The only sub I made, was adding shredded zucchini instead of sweet potato, as I have vast amounts of zucchini at the moment. I made sure to squeeze out the excess moisture so that I could ensure they would still be crispy. Lovely recipe! Loved these cakes. It does take a bit of time to prepare but is worth the wait. I used mixed red and white quinoa. I also probably made them a little big as I got 10 instead of 12. I’ve frozen 6 of them after cooking. Hoping they taste just as good the second time round. Thanks for the recipe and great blog. Thank you for this recipe. My teenaged son has gone vegan, so I am always looking for good recipes, preferably soy-free. I made this last night, following the recipe exactly except for two changes. I used buckwheat flour instead of all-purpose flour, and I used cooked sweet potatoes because I had some in the frig. They were the pale-colored variety, yellow instead of orange. They were delicious! Everyone loved them. These look so yummy! I don’t think I’ve ever put sweet potato in veggie burgers before, but it sounds like I’m missing out. Love the crispy texture idea through quinoa! I love quinoa but have never tried making cakes with them before. This looks so delicious and filling! I like how you used fresh basil in this recipe! Basil is one of my favorite herbs! Just curious- for the sweet potato in the quinoa cake itself: did you roast it first, or did you use a raw potato? I have not tried this combination I am looking forward to making them. I am a new Vegan still learning how to eat and get everything I need. I have your cookbook, speaking as a new Vegan I love it !!! So easy to follow and the recipes are great. Theses look amazing, I can’t wait to try them! QQ – is the sweet potato raw or cooked? Thanks for filling my life with so many delicious and healthy recipes! Will be trying these soon!! Looks so so delicious! I just made these for dinner. Absolutely fantastic flavour and texture. It’s obviously a good recipe as it can stand up to a little “oh no I’ve run out of….” subsitution. I used finely chopped broccoli as I had no kale, left out the onion, added more garlic and a good spoonful of my beloved piment de Espelette. This looks amazing!!! So many good ingredients in there… yum!! I am adding things to my blog that I cooked/ baked back in early spring. Christine, what a great combo. I was in hurry making the recipe and just didn’t have time to come up with the “sides”. I will have to try these out. Never commented before – but had to this time round because this is the first time I’ve tried something the day you posted it (normally I wait a while to see if other people experiment with replacements since not everyone in my family is strictly vegan, or even vegetarian. And since we’re not, sometimes if I buy something specifically for a vegan recipe and only use a tbsp, well, sadly it often goes to waste before it gets used again. I digress). These are amazing! I did end up substituting the tahini with sesame oil 1:1 (our tahini had gone bad). Even my dad, who was at first disappointed there was no meat with dinner tonight, loved them. So so good!! Thank you Alexandra! I’m so happy you enjoyed it so much. Thanks for your quick feedback too! Made these last night… amazing! There was one that was a little thinner (end of the bowl) and it was rather dry; so be sure to keep them more on the plump side. I usually don’t leave comments but… these were fabulous! I made them last night when I had my grandmother over (a strict believer in “vegetarians still eat lamb… right?”) and even she was impressed. For those of us like me who still dream of a food processor and a vitamix this recipe was easy and approachable. A sure to be staple in my fridge from this point forward. I used raw grated sweet potato in the quinoa cakes. Thanks for getting back to me so quickly . I just made two batches – love them. The regular red potato worked great! Served these with your avocado basil cram and fresh sliced heirloom tomatoes from our garden, and they were awesome!!! Thanks for all your great recipes and inspiration!!! I have to start by saying I am not vegan. I do eat meat occasionally, but am largely vegetarian. I made these for the second time tonight. Tonight I changed them up by substituting a mixture of spinach and kale, swapping cilantro for the basil, and adding finely diced jalapeño. We topped it all with mango salsa and blackened cod on the side. Amazing. These look so yummy, I just restocked on quinoa so it’s perfect! yay! I finally made them today, they’re SO GOOD! The combination of flavours is fantastic and they were rather quick to prepare as I had cooked quinoa on hand. I shared them with friends who tend to turn their nose up at vegetarian/vegan food and they also loved it. Another winning recipe which will be in heavy rotation over here. Thanks! The weather has been so bleak in Toronto and I am craving sweet potatoes already! These look amazing, colourful and fresh. Here’s hoping the weather gets nicer but in the meantime, I am preheating my oven to make these. Thanks so much! This Quinoa Cakes look phenomenal and I love that they are a bit different that the average go-to bean or lentil burger (haha, as much as I love beans sometimes I don’t feel like a whole bunch of beans for dinner!) :D I can imagine how great these burgers taste with a big bowl of crispy greens!! Yummyy!! Made these tonight. Insanely good! I always keep cooked quinoa in my freezer so this was a cinch to make. I also used my food processor to chop everything finely and save on time. I also subbed hempseeds for the sunflower seeds due to allergies in our house. Thx for such fab recipes. These quinoa cakes are sitting in the fridge waiting to be baked tomorrow. I had to substitute dried basil for fresh ‘cos when I pulled out the fresh basil….well it wasn’t that fresh….. Instead of the “runny tahini”, I used your Ultra Creamy Hemp Seed Dressing. I will have to freeze most of the burgers. Angela, could you remind me/us, why you choose to bake your burgers before freezing as opposed to freezing them raw? So…I made them tonight with a twist.. I didn’t make burgers….I put the mixture in tart shells, to have sort of a “meat” pie experience. Quite good. These look so good! How rude of you to make us wait 2 1/2 months though…I guess we’ll let it slide this time since you are preggers :) Love the recipe and your pictures are beautiful as always. These are fabulous! Just made them tonight and they turned out great. Carnivore husband enjoyed them as well (with some cheese :)). Angela – such a fan of so many of your recipes! What about the “politics” of quinoa, which is why some of my friends have stopped eating it. I say all food is political, but quinoa in particular us drawing more awareness and reaction. Your thoughts? I made this on Friday evening (without the sundried tomatoes because I didn’t have any!) and loved the recipe. I thought that they were a little dry on the first night I ate them and had a very strong taste of flour. I whipped up a little vegan tartar sauce and that really helped even out the dryness! However, like most (or all) vegetarian recipes, the cakes were so much better on the second and third (and soon-to-be fourth) nights after the ingredients could settle with each other and mix flavors. I also thought they were better pan fried (after being initially baked) to add the crunch and savory-factor. It was so exciting to be able to make quinoa cakes after years and years and years of making quinoa salads. The New York Times once posted a recipe for variations on quinoa cakes and their recipe did not have any binding agents (the cakes were supposed to stick together by the moistness of the hot quinoa alone – HELLO). It was a disaster. I am so glad to know how to make these cakes now and look forward to including different ingredients. These are wonderful! I tried these over the weekend. I love the flavour combinations. What a great idea! In response to some of the comments, these froze really well. I just defrosted it and popped it under the broiler for a quick breakfast this morning. I had it with avocado and vegan sausages- definitely a keeper. I should mention, I made some alternations- I didn’t use oats or flour. I used 2 tbsp of almond flour and surprisingly it held together well! I used frozen spinach (defrosted) instead of kale because that’s what I had on hand. I didn’t add sunflour seeds but I definitely will next time, my sun-dried tomatoes weren’t oil packed and I used chives instead of onion! One last note, I grated raw sweet potato and added it. I’m not sure if it was supposed to be cooked but it worked and I think it would work either way. Thank you Angela! I made these on Friday and we splurged and had them with french fries. So good. We had some of the leftovers on a big salad on Sunday and I had the rest in a wrap on Tuesday. There is no bad way to eat them! Made these for dinner Saturday! Great recipe – they hold together well (used regular all purpose flour), taste great, and were good on salad as well as in a wrap or all alone. Even my toddler ate them (albeit with a bit of bribery to get her started!). 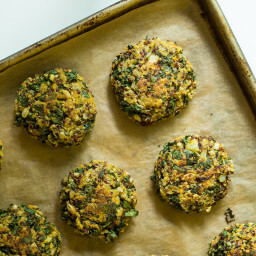 Just made these for dinner; my daughter and I loved them, but my 12 year old son prefers your chickpea yam burgers. Can’t fault him for that, they are delicious, too. I made these tonight, and they are sooooooo delicious! I will be making them again and again! Thanks for the recipe! My first comment, yay! So I made these last night, and I as I when I was shaping the patties, I was worried that they would fall apart. But once they were baked, they “gelled” perfectly together. The taste was fabulous too…well basically anything with tahini paste is fabulous. I’m writing from Israel, so tahini is staple product in our households! Thank you for this blog -OSG is the heart of our kitchen! This recipe is four and a half. (I need to ‘save’ the half star for another recipe I love and which my husband raves about). Served them hot with fresh tomato salsa. There are a few left in the fridge – lunch today for sure! I have loved many of your recipes, however, this one did not meet my expectation of wonderful. The cakes were bland and way too dry. I have tried making patties before (lentil, veggie) and always find the same problem. Either there is too little binding agent and they fall apart or they are dry. And they are always a lot bladder that I like. If you have any suggestions on improving, I would love to try again. I found with the sundried tomato and sweet potato, it added a lot of moisture and flavour. I wonder if you need to up the sundried tomato or sweet potato content? Just a thought. I am so excited to make these! They look and sound amazing. Quick question – I have sun dried tomatoes but they aren’t in oil. They are just dry, not in any liquid. Would those work okay, or should I buy oil-packed ones for best results/flavor? Thanks for all you do, and congrats on the little one! Hi April, I tend to prefer the flavour of the oil-packed ones, but you can totally use dried too. Just be sure to soak them in water until soft before using. Hope this helps and thanks for your congrats! I made these last night for my husband and I and they were delicious!! We are not vegans, but we still like to take a break from meat every now and then! The instructions were easy to follow and I feel like there could be so many things added to change the recipe up if we ever needed to in the future!! I know this meal is going to appear a lot more in our dinners from now on. Sometimes it is so difficult to come up with interesting meal choices, so I really appreciate your creativity in putting together this recipe! These are absolutely awesome! Can think of a whole lot of different ways to enjoy them. I think this is one of my favorite recipes, though there has been many! I love this bean-free cake. Almost like a quinoa falafel or something. Hi! My name is Maria, and I am the editorial assistant at KrisCarr.com. We would love to feature some of your recipes on the website (with credit to you, of course). Please e-mail me if you are interested. Thank you! Angela what do you sprinkle on those avocado slices? Looks delicious! Hah, I am 37 weeks and trying to write my dissertation with a “preggo brain”! Some days I think I’ve been lobotomized! 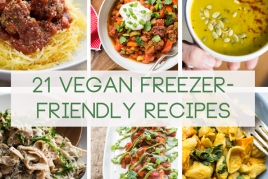 I am making a list of freezer friendly foods to whip up this weekend! Made these last night and loved them! Looking forward to having the leftovers later! Easy to make and very versatile. I was looking for something good to put in the kids school lunches and this looked like the ticket. I made these last Saturday and they lasted only a couple hours. My oldest said they tasted like lasagna. I made a double batch on Monday and they are quickly disappearing as well. So easy to make and absolutely delicious. Keep up the good work Angela. I made these last night, they were very tasty. However, my mixture was too sticky to make into patties. I ended up flattening it out in a tray a making more of a loaf. What should I have done? Added more flour? Or in future add the flax mixture in a bit at a time? I appreciate any advice. Oh and the cookbook is ace! I particularly love the african stew. Yes, I would add a bit more flour if your batter was sticky :) Each brand of flour will work a bit differently – no worries! Glad you enjoyed them anyway! 4 stars because they were time-consuming and came out flat and dry – 5 stars for excellent taste! Subbed: 2 T tomato paste for sun-dried toms, and 1/4 c. chopped garlic chives in place of fresh basil. Next time will cook for shorter period of time and form the patties rounder to reduce the over-crispy factor. Will definitely make again. I made these last week. Instead of sweet potato, I grated up some pumpkin, because that is what I had on hand. These quinoa cakes have a great crunch and texture. I made a vegan cucumber taziki sauce to serve with them. I ate a couple right when they came out of the oven and then froze the rest. I have been adding them to my salads for lunch or putting them in a pita with lettuce and tomato and eating it as a wrap. Freezing them was very convenient for our busy schedules. They are great! Nice flavours and held together well! I made these today, popped one in my mouth off the tray and BAM! So delish. Angela, subbed a few ingredients with what I had in the house (ACV instead of red/white, quinoa flour instead of all purpose, and fresh parsley/coriander with dried basil) and they still sung – you are awesome. Will be making a double batch soon to freeze. Excellent on a salad or would be amazing as a vege burger pattie. Oh and I had a cold one from the fridge a few minutes ago with garlic cashew cream as a dip – divine! Only tip is to make sure your hands are wet when you mould them and I greased my baking sheet with coconut oil instead of using baking paper and it worked a treat. Out of these…what a breeze. Also, these smell amazing while they are baking. :) Making these again when school starts, either for a sandwhich, wrap, salad…what a neat snack. Thanks! I love the concept of these. But I would add, the prep time is definitely over 25 minutes, more around 45 . I also was unable to keep the cakes in one piece. I’m not sure what I did wrong. Perhaps they need to cook a lot longer. I hope to get it right. I love your recipes! Made these and my husband and I both love them! A little effort in the preparation, but so worth it. A great lunch item to take to work. Love your blog! I made these last night for company and they were delicious, though they didn’t become golden brown like yours are in the picture. I’m going to try them agains today (because we ate all of them last night), and correct my one mistake – to finely finely chop slice the kale. My I thought I finely sliced it but it was tough to get the patties to stick together. Super delicious though! Made this recipe for dinner last night. It’s definitely not as good as the perfect veggie burger on your site, but then those are unbelievably amazing! These are pretty good for a change, or to have as a snack. 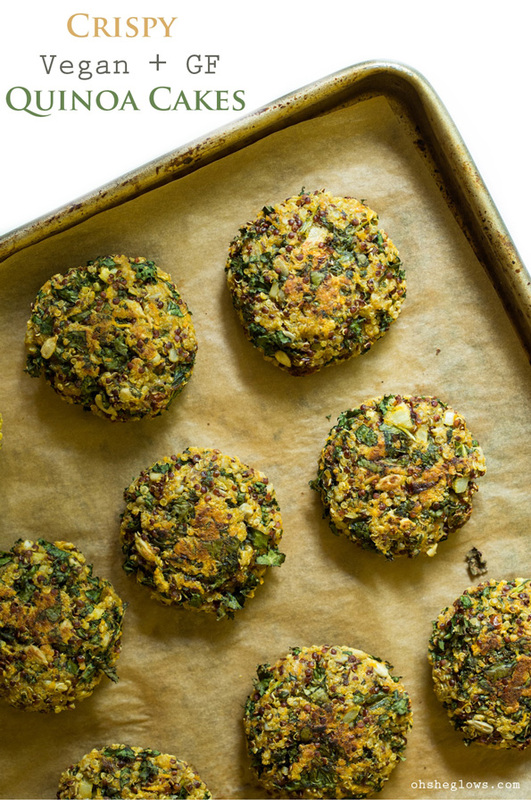 These are some of the best veggie patties ever! I’ve tried so many recipes that didn’t stick, didn’t get crisp, or were lacking in flavor, but these were perfect, and simple to make =) I’ve enjoyed experimenting with different veggies following the layout. Subbing carrots for sweet potatoes, a chopped thai chile for chile flakes, and beet greens for kale have all been successful =) Made this twice in the past three days, and having it again for dinner tonight! I made these tonight for dinner and served them on top of an arugula and avocado salad. The cakes were tasty, but I recommend cooking the onions first as they were a bit overpowering. I just made these! Yum! Any idea about the protein content? My daughter is allergic to potato and has some reaction to squash…would canned pumpkin work, or will it be too wet? Not overly impressed with these. I was expecting more flavor. Can I use gluten-free steel cut oats instead? That’s all they had at the store.. I LOVED these! I made a batch of these on Sunday night to eat for lunch throughout the week. These cakes taste like no other “veg burger” I have tried- flavor packed!! I served mine with half a sweet potato and it turned out to be a great lunch! I’m not sure I would make these on a weeknight only bc their are quite a few ingredients, prep time, etc. But once you make them, you will be happy to have them on hand in the fridge or freezer! Thanks for sharing the recipe! I’m so excited about a patty that doesn’t use legumes! I am enjoying my first one right now and it’s delish! Going to have it with spaghetti squash with some roasted tomato-garlic compote! I just made this ! It was awesome. It was my first time making quinoa cakes,and they came out fantastic.I had to swap some ingredients because I dint have everything at hand. -To swap the sweet potato I used the same amount of shredded butternut squash. -Instead of using flaxseed I changed it for the same amount of quinoa and upped the water to 8 tablespoons. -I also used sundried tomatoes,reconstituted in warm water while the quinoa was cooking. As a side I did a mix of roasted white potatoes and butternut squash,sliced aguacate and boston lettuce salad. I recently bought your book and I wanted to let you know that all of the recipes I have made so far came out amazing,and it really helps me with my transition to a plant based diet. Keep up the beautiful work you are doing and thank you for your inspiring blog!!! Have made these twice already and loving them! Super easy, and very versatile. Great for meals, and make a great snack when I need something quick! These are amazing! A friend and fellow follower of yours made them and gave me 2 to try. I wished there were 40 more. Because I would have eaten them all. I’m going to make a huge batch as soon as I can. For others asking if you can skip the sundried tomatoes, I don’t recommend it… They add soooo much flavor!! I made these and they were pretty good. They held together and were crispy. I think I liked them even better, though, after freezing and then microwaving. I tend to use a tiny bit of BBQ sauce to add a little more flavor. We are trying to eliminate meat from our diets and I found your blog while searching for recipes. It’s a challenge because my 6’6” carnivorous husband is very meat-dependent and, though this elective change is going to require flexibility and open-mindedness on his part, everyone deserves to feel satisfied after eating a meal. Well…I made these last night and Oh My Goodness – they are fantastic. We both LOVED them. I adapted it only to suit what ingredients I had on hand (an egg instead of flax, lamb quarters instead of kale, dried spices instead of fresh, red potato instead of sweet) and I like that the recipe is flexible enough to work with the pantry. We ate them for dinner topped with two pinches of shredded mozzerella and a generous drizzle of chunky tomato sauce, and paired it with a salad dressed with EVOO and sea salt. FANTASTIC. …And I’m picturing the leftovers sliced up in a wrap with shredded cabbage or mixed greens and sliced avocado. Hellooo lunch! :) I know this will be a regular meal in this house, and I’ll be frequenting your blog daily! Thanks for sharing your great ideas! I made these last week and they were great! Even my husband liked them and he usually shies away from my healthy food! I made these the day they were posted, and I am back again to make them for another couples days of lunches! They were amazing, and absolutely perfect with hummus. It was a great option to take to work, and they kept me full for a good while (which is no easy task) I didn’t have any sweet potato on hand, but lots of carrots, so I subbed those in. Thank you for this amazing recipe, I think it should go in cookbook #2! Loved these! Easy to make a bunch and freeze. The recipe is also pretty versatile so you can sub spinach for kale or even leave it out. And my one-year-old loved them! Angela, could I use EnerG Egg Replacer instead of the flax seeds? If so, how much (equivalent to how many eggs?). Thank you! I LOVE your site and your cookbook. Thank you for creating both and sharing your talent and happiness with us! I tried making these with the EnerG Egg Replacer instead of flax seeds, and it worked out well. De-lish! Everyone loved them and went back for seconds. I served them on a bed of arugula tossed with your Lightened Lemon-Tahini dressing….they complimented each other well! Made these today and they were amazing. We had tons of carrots from our CSA so I subbed those for the sweet potato and it was great. The sun-dried tomatoes and greens really take these beyond other quinoa cakes that I’ve made. The chopping and grating took more time than I had anticipated, so I think that next time I’ll make a double or triple recipe and freeze some to enjoy later without the work! I waited with much anticipation for these adorable little cakes to bake up because I REALLY wanted them to taste amazing after I saw how much nutrition was packed into each one! I wasn’t disappointed! I preferred them “with” something (a bite of this or that with a bite of the quinoa cake) but still pretty delicious on their own. I liked them even better the next day for breakfast (crisped up and reheated in a small skillet with coconut oil) served with a fried egg. I can’t wait for lunch so I can crisp up a couple more served with slices of avocado. I made these tonight and they were a big hit with myself and my boyfriend! I wish I could say there were leftovers for tomorrow haha. I used white quinoa and substituted the kale for baby spinach because I had it on hand. Absolutely delicious. They browned and crisped up very nicely in the oven and I served them with a side of roasted vegetables. Thank you! These are Amazing! Being a fan of your fav veggie burger, I wasn’t sure how I’d feel about the but I love them! The kale adds a beautiful crunch ;) Served both yesterday for the labor day holiday and all the family was blown away! Another success! Made these yesterday evening, not the best time to do a new recipe as I messed up the quantities a few times but got there in the end! I also substituted the Kale for Spinach as I prefer it. Overall the taste was good but I think I’d add in more sweet potato. I had a couple this morning with some slow roasted cherry tomatoes and it was a pretty delicious breakfast with a nice green smoothie. My husband and I enjoyed these very much! These look so delicious, and would be fantastic to also take to school as leftovers. I have a mildly annoying question – I am actually allergic to quinoa (Tragic – I know!!) – do you think millet would be an okay replacement? Or any other grain you can recommend? Millet will impact the flavour, so you might need to adjust other ingredients to taste, but I’d imagine it would work as a binder quite nicely. Let me know if you try it out! Hey Angela – I just wanted to let you know that I tried them with millet and they were AMAZING. Even my non-veg friends were asking for the recipe! I didn’t adjust for any flavourings – except maybe adding in a bit more salt (and cayenne because I like a kick). The flavour of millet was extremely mild once mixed in with everything, so didn’t seem to matter too much – although I imagine quinoa would have a nuttier flavour. Love these!! Thinking I need to make another batch very soon! I baked them, let them cool and individually wrapped them to freeze. I was able to reheat the frozen ones and they were just as great! I used Southern style quinoa, and the cakes ended up tasting kind of Italian. Yum!!! These are delicious! My son (21mo) and husband loved them and they aren’t easy to impress. I fried them in a bit of butter to reheat and they were amazing. In general, I love OSG recipes but I must say that this one was a flop. As other reviewers have mentioned, the raw onion/garlic flavor completely overpowers the dish, which is otherwise fairly bland and dry despite the many great ingredients. At least it’s a nutritional powerhouse. I served them with the roasted red pepper and almond sauce from the original recipe and found that it was the thing that saved the dish. I made this last week after my daughter ran out of her veggie burgers for lunch. This was a great change for her. It came out just the way I expected. My daughter gave me thumbs up. Thank you! These were sooooo good I actually wake up in the middle of the night thinking of them. And no, I’m not pregnant! I particular enjoyed them right from the fridge with fresh greens, avocado and quinoa. Will be making more very soon. Hi. I love the taste of the vegan burgers my daughters have shared with me from Oh She Glows: tasty satisfying, filling. My question: as a woman with insulin dependent diabetes (for 50 years!) it is essential for me to know the carb count of everything that I eat. Is there a Nutrition facts list for any of these wonderful recipes? Any info would be terrific. I want to be more vegetarian, but cannot consume more than 20-30 carbs per meal. Thank you so much! These were great. I froze some, but I’m yet to try them from the freezer. I’m sure though they will be fine. I added chickpea flour instead of GF all purpose….by mistake, I was in a hurry and quickly grabbed the bag, not realizing until I was putting the bag back. It worked and it tasted good. Can you explain more about “runny” tahini? Is that just using to oil? The tahini just shouldn’t be too thick. It should be quite thin. These are so good and so worth the time to make. Yes, I ate them cold out of the fridge for breakfast and they were still yummy! Thank you! I am saving this recipe! I made these this evening and they went over well with everyone (including picky 3 yr old eater). I substituted sunflower seed butter for the tahini since my kiddo is allergic to sesame, and they were great. Thought I’d post just in case there are others wondering what to use in place of tahini. These are drop-dead delicious. I made these Tuesday night, I “tested” about 5 of them straight from the oven, I just ate the last of the batch for lunch today. So good. Next time I make these, I need to make sure I eat dinner BEFORE I make a double batch of these bad boys so I can make them last! This is the first recipe I’ve ever tried from your website. You have a new return reader! Delicious- the sun dried tomatoes really make it. Thanks so much! Tried these tonight and they were really good! Topped with fresh roasted tomato and garlic coulis…would be nice as a slider with some grilled onions too! Both my 16 year old daughter and I love these, but we are both allergic to potatoes. I use squash instead. When I made them, I thought they were a lot of work but these are utterly delicious. They taste even better reheated the next day. People were coming up to my desk at work to ask what smelled so good. The second time I made them I cooked the quinoa in vegetable broth and they were even more flavorful. They also combine well with lot of different flavors. My husband hate Quinoa (I don’t know why! He is crazy). What can I use in place of Quinoa in this recipe? Hi Andria, Millet might be a good sub, but I haven’t tried it yet. Let me know if you try anything! I love your recipes!!!! I have recently started cooking vegetarian because of my boyfriend who was recently diagnosed with colon cancer at 43 and he has basically gone vegan but I am not there yet. ;) I love your site, it has been an inspiration to me to eat better. I can’t wait to try these quinoa cakes. I have tried many of your dessert recipes and have not yet been disappointed. Keep up the good work!! So you don’t have to cook the sweet potato ahead of time? I didn’t see any comments about it so I am assuming you don’t..
4 stars because it was yummy. We put them in a wrap for dinner and on top of a salad for lunch. Not 5 stars because there is a ton of ingredients it was a PITA. I just made these for my roommates and they LOVED them! Such a wonderful combination of flavours! These were awesome! My husband and I both really liked these. I used dried garlic, onion, and basil because I was lazy and forgot the kale (which was okay because I served it on a bed of greens with kidney beans anyway). Next time I will try to stick to the recipe exactly (except I will still use dried basil because my husband doesn’t like fresh). Thank you! I loved the texture of these but, I would like a different flavor theme. I am not a huge Italian fan. Mexican? Hint hint :) I will play around with it though. Thanks for posting! I changed my mind. I reheated these today and thought they were phenomenal! Yum! These are amazing. I love the taste! But I do have one problem when cooking them (tried 3 times). I’m having a hard time when flipping them after 15 min in oven. They are stuck to the baking sheet and half the batch break. Last time I tried to grease the baking sheet with olive oil before placing the cakes, but that didn’t help. Any idea what to do? I line the baking sheet with parchment paper (not wax paper) – no issues with sticking! I meant parchment paper where I wrote baking sheet. Sorry, English is not my language.. The cakes get stuck to the parchment paper. I just tried these quinoa cakes and even after checking the ingredient list 5 times before mixing everything together and cooking them I forgot the oat flour. The oat flour which I had to make with a stick blender. Maybe I forgot it because I was thinking about how good the breakfast cookies were which I had also just made. The good news is that the quinoa cakes can be made without the oat flour. These looked and smelled amazing. The taste was just okay. I made the suggested sides and the meal was good, but I don’t think I’ll repeat the cakes. They reminded me of a homemade veggie burger, but not quite as good. Still, even if it doesn’t become part of my rotation, I was happy to put something new on the table. I made these tonight for myself and my boys (2.5 and 4.5 years). They were a huge hit! Definitely kid approved. Gobbled them up in a flash and requested another one. Great recipe! I just made this recipe and it taste WONDERFUL!!! Thank you so much Angela, I am so glad you share this with us!!!! Many many blessings for you and everyone!! Thank you so much for the recipe. I tried this recipe without tahini and vinegar. In addition to quinoa I also used boiled millets. I took 2 tablespoon olive oil heated and seasoned with mustard seeds, cumin seeds and dried powdered curry leaves and added red chilli powder to the oil and mixed with all the ingredients . Also I added finely chopped fresh cranberries as I didn’t have dried tomatoes. I also added cabbage, aspharagus instead of onions. I had to heat my oven to 425 F . The cakes tasted super. All my friends liked very much. These sound awesome! I have everything but the sweet potatoes…I have some pureed, though. Would they be too mushy if I used a bit of puree instead of grated sweet potatoes? I think the puree could make the patties too moist, but not sure! Wow these are so good. I really miss “crispy” going GF but this satisfies. I also substituted an entire jar of black olive tapenade for the tomatoes and this is great for olive lovers. I love this recipe! Perfect for my food allergies! Only I was wondering what would be a good substitute for the tomatoes? I can’t have tomatoes. Just made these tonight and wow, yum!!! I didn’t read thoroughly enough because I was multitasking (making your spiced lentil soup, which I love dearly) and I added all of that quinoa….oopsies!! But they still taste great and held together quite well despite double quinoa. I realized when the first batch was in the oven, so I added a bit more flax egg to the second half just to be safe. I had to really stop myself after scarfing down two because it’s late and I want to freeze a bunch. They taste great with ketchup!! Loved these crispy cakes! Made a bunch, froze them on a cookie sheet, then when they were solid, packed them into a freezer bag. I thaw them and heat in oven. Great recipe thanks – A good meal the night before a big training run or race. These are wonderful! I’ve just made a double batch, because I want extra for the freezer (if they last that long). This time around I was out of sunflower seeds, and too lazy to go to the store. Instead I used cashews whirled in the food processor and got great results. I also threw in an extra 1/2 cup of sweet potato, and it didn’t hurt the end result a bit! I serve them with potatoes “creamed” with almond milk and chives, and onion gravy. Next time, I’m going to try throwing everything in the food processor, and making larger sized patties for veggie burgers! These look super yummy! Is the flax mixture to replace an egg? Can I just use an egg? Thanks! Hi! The side dish in the photos looks fabulous…are those sweet potatoes? These burger/cakes were a hit with my family. I had to substitute the nuts for walnuts and I pulsed the kale in my food processor into pretty small shredded pieces. We loved the crunch! Thanks for another wonderful recipe!! i read all the comments and i jotted down all the different options for flour and vegetables and using chia seeds! i stumbled across your recipes and i am so excited to try em all. keep up the great experiments for us all to reep the benifits. I can’t wait to try this recipe. I’m trying to make the switch to vegetarian because as a dancer I’m supposed to have a mostly plant-protein based diet. I’m already a quinoa and kale lover so I think it’ll be perfect for me! Any tips on making the transition from meat lover to vegetarian? I just mean, sometimes when you get to the bottom of the jar and it can be thick and hard to scoop. When I say runny, I mean the normal consistency you would see when you open a new jar and mix the oil that is often on top throughout. I made these and loved them. Going to make them again but the only thing I dread is the chopping and grating…has anyone had success just throwing everything to be chopped into a food processor?? How long do you cook them for in the frying pan? Just like 7 minutes on each side on medium-high until they get crispy, and then leave them for about 10 minutes in the frying pan off the heat to make sure they’re cooked all the way through! I don’t usually comment, but I absolutely had to after I pulled these out of the oven. I actually just finished enjoying one off the baking sheet! Haha. I followed your recipe exactly as is and they turned out perfect. They couldn’t be made better! I also need to say thank you for making such high quality recipes – and I do not mean ingredients wise. Every measurement, time reference, and suggestion are always spot on. It helps to turn out killer meal after killer meal time and time again. Thank you for being so precise and accurate with every detail! I have my full trust in you and all of your recipes. These are great! My two year old, who is quite a picky eater said “I like this” when I wrapped them up like a “burger”. These turned out great! Thank you for the wonderful recipe! I won’t give these a rating because mine came out kind of dry, so will try again and see what happens before giving it stars. Perhaps I did something wrong? The flavor of the patties were really, really good-so good that I had several large “tasting spoonfuls” ahead of time. But when I tried to get them on the pan I could not for the life of me get them to stick together to make cakes out of them. So I added a bit more flour, which worked well at getting them to stick but perhaps that is what made them dry? I also had a ton of the white quinoa on hand so I used that instead of the red. So maybe that was a factor also. My coworker had these for dinner one night and loved them so much she told me about them and sent me the link which turned me on to this website that has provided me with dinners for just about every night last week and now this upcoming week, so I am going to try again. When I told her mine came out dry, she said that hers didn’t at all but that they wet their hands for every patty, so maybe I will try it that way. As it was, we added ketchup on ours and once we had that addition, we scarfed these down so all in all it was a success, but I am hoping I can make my next ones come out looking like the picture. Loved the addition of the sundried tomatoes. Yum! I just made these and they are incredible! I’m glad I stumbled upon your blog! To quote my 11 year old…”these are delish!” This recipe is fabulous. I had already run out of time to make them the day before, so I couldn’t resist using the food processor to do the work (grating, chopping, etc…) once I’d ground the oats. Everything just went in the processor. Though i had already chopped the kale the night before. They turned out great that way…just not quite as pretty as yours. I think I’ll add more sunflower seeds next time and see if those ground with the oats make enough ” flour” to leave out the wheat flour…either way works for us though. Served them with sliced avocado and just threw the leftover sweet potato in the oven to roast like you did. Thanks for the inspiration! I just made these the other day & they were delicious! I was out of kale, so sadly there wasn’t a lot of green in them other than the basil, and I substituted the tahini for almond butter, but they still turned out great! Next time, I think it might be nice to try Indian flavours the next time – maybe some curry powder, turmeric, & a pinch of cinnamon. Might be nice! Thanks for a wonderful recipe, Angela! Just made these for my dinner. Delish!! Made a double batch exactly following the recipe. Froze them on a sheet pan and then transferred to a freezer bag. Tonight, I took out a few and reheated them in a pan with a little olive oil. SO GOOD. I’ll definitely be making these a part of the regular menu. Dinner was done in 15 minutes! Thanks for another great recipe! These look AMAZING! They remind me of the wonderful veggie puffs I used to make in our pre-vegan days! Any suggestions for a workable substitution for the tahini? I can see what an important binding role it plays, but we’re allergic to sesame. Thanks! Hi :-) I’ve recently decided to go vegan and have found your blog so useful! This will sound like a really dumb question so apologies… but I’m new to a lot of this food. I’ve read that flax can be really dangerous if you cook it, as it becomes ‘unstable’. Is this true?? made these last night. Had a hard time for them not to fall apart. Had to cook way longer than the suggested time. Don’t know what I did wrong. Do u have any suggestions in how to make them not fall apart. I just made these and I can’t stop eating them. I live in Costa Rica so I couldn’t get ahold of any sunflower seeds or tahini at my local supermarket but they still turned out amazingly!!!! I have been sending this recipe to all of my friends. AMAZING AMAZING recipe!!!! I didn’t have all the ingredients so I substituted here and there. Used pesto instead of sun dried tomatoes and ancho chile powder instead of red pepper flakes. Still delicious! This recipe could be prepared lots of different ways! have made these a couple of times and they are my favourite way to use up leftover quinoa. My daughter-in-law just loaned me your cookbook which she might not get back :) And I just put it together that this recipe and the great cookbook are the same author! Oh yeah! Finally made these. It was all so crazy – I had some tired Kale in the crisper, some sad looking sundried tomatoes (not in oil, but I soaked them in oil briefly), and AMAZINGLY, I had every other ingredient I needed for these right in the cupboard. Oat flour – check! Tahini – check! and on and on. I can’t tell you the last time I had everything I needed when I decided to cook some random recipe. And my tired kale and sad tomatoes became this awesome burger! Thank you! Tried this recipe earlier today and it turned out delicious! I replaced the tahini for some regular tomato ketchup and omitted the sun dried tomatoes as I forgot to grab some on my grocery run. It turned out so well, was just the right amount of crispy and I served with some guacamole and toasted energy bread. Thank you so much for this gem, I’m definitely making this for the next time I have guests over. Made these for the 2nd time, with the sole intent to freeze them ALL. My 10 year old has already eaten half a pan. He declares them his favorite ‘burger’ ever, even though I told him they’re more like a type of latke. Thanks for sharing the wonderful recipe, my whole family is glad you did! I recently tried a vegan cauliflower cakes recipe from another site and was disappointed. I made these for lunch today and are they ever a hit! I used what I had on hand so ended up subbing rice vinegar for the wine vinegar, spinach, used mostly dry basil, sundried tomato pesto, no sunflower seeds. They are delicious and i think we’ll finish them off before dinner! I had mine with tomato salsa on top. Thank you for a fabulous recipe. I always come back to your site because so many other food blogs have real hit or miss recipes, whereas with your recipes I have NEVER been disappointed. I also think I’ll try making these in mini muffin tins and keeping some in fridge or freezer so we can enjoy with a glass of wine in the evening. First of all, kudos for a quite creative and flavorful quinoa patty. It is also very aesthetically pleasing. That said, I am giving this a three for the following reasons: I followed the recipe as it was written and the result was dry and chewy rather than moist and crispy. I’ll probably have to tweak it for my oven. For my tastes, of course, there was too much stuff in it. The sunflower seeds don’t add anything to it except make a lot of work to chew the patty. Will try again sans the sunflower seeds and maybe add more sweet potato to keep it moist. Thanks for something different. Just made these and they are unbelievable! Will be keeping these in my freezer at all times! hi . I am a novice with cooking & have most of the ingredients except red/white wine vinegar & the tahini paste – can I leave these ingredients out while making the recipeOR are these must haves ? if so, can you please suggest alternatives? e.g. will almond butter work instead of tahini paste? These are amazing. But can you freeze them raw? I don’t think I’ll be able to eat them all! Can you recommend a dipping sauce that would go well with these? Thanks! These were AMAZING!! Even my mum who hates quinoa and sweet potatoes loved them. I used the leftover sweet potatoes to make Chips (fries) and they went perfectly with these cakes. Thank you! These look truly heavenly! going to try this recipe today. Unfortunately we dont get sweet potatoes her in Costa Rica but will try with regular potatoes. Thank you so much! You have made me a much better cook. Does anyone have a suggestion for sun-dried tomato substitution? Or how I can adjust the recipe to leave them out without messing up the consistency and balance? I made these and used them as the base for “bennies” – put some sliced tomato, avocado, salt, pepper and a poached egg on top – it’s my new favourite meal! Awesome recipe. I’ve read all the comments. I want to make this, but I don’t have all the ingredients. I’d like to use egg as a binder, but I am not sure what I can omit to do that (what serves as the binder here). I believe the Flax seeds serve as the binder. They’re used often as an egg replacer in vegan baking. Since it’s 2 tbsp of Flax, that should be 2 eggs. Hopefully Angela can confirm! Do you have the nutritional information about these? I made these to take with me on a road trip with family and friends to a lake house. I’m a new vegan so I’m still getting used to being prepared food-wise for trips. These were the PERFECT thing to make for the weekend! I ate them as a burger, as my main non-meat dish for dinner, on salad, etc. They are so delicious and were super convenient to have for the trip – will definitely make these again! Do you think these can be grilled? It’s hot out today and I hesitate to turn my oven on! :) Thanks! Can I grill these on the grill?? Do these quinoa cakes freeze well? I have been following this website all summer and have had some delicious successes (I’ve ordered the cookbook). Last night I served these patties with the Budda Bowl. Delicious combo, as the Budda sauce goes well with both. My husband loved both and took leftovers to work today. I had cold patties for lunch with chipotle sauce – MMM. I just have one bone to pick – 16 ingredients? Really? Even Rene Redzepi doesn’t do that – and this is Tuesday dinner. Once you add tahini sauce, what’s the point of sun dried tomatoes, basil & oregano? Anyway, they are yummy and I will definitely be making them again (without the extras). These are so Delish! Made me very happy….will they freeze ok? Great recipe! My 5 year old, 2 year old, husband, and myself ate up every cake and loved it! We added a Sweet mustard sauce to drizzle over the top and used the extra quinoa as a bed to put the cake on top with the left over kale:). Thank you! I love this recipe and the vegan chocolate chip coconut oil cookies so far!!!!! More to try! Great recipe! We put them in lettuce wraps with hummus and tomatoes and it made for a nice, light, summery meal. Thanks so much for this recipe!!!!! it is one of my go to’s fo sho! These look awesome! I’m wondering if you know approximately how many calories are in a serving? I’m putting a meal plan together for my parents and want to include these for breakfast but I think they’ll be wary without knowing the calorie count. Thanks! How about someone actually leave a comment for AFTER they made the recipe, to let us know how they turned out! Not one single review! Nothing but:….They look great….Gonna try them…..They look great….. I made these yesterday for my husband and I and there is one left today! They were so good we kept picking away at them all day. Made just as directed and will make them again-soon. Made these last night and they turned out fantastic! I used a Quinoa & Bulgar blend for the grain and substituted the oil-packed sundered tomatoes with roasted red peppers. Reheated the leftovers tonight and they were equally delicious the following evening! mine kind of fell apart and didn’t stick together well. Im not sure what I did wrong.Is there something I could add next time to keep them together better? I should add, I ate my with the Buddha bowl sauce too but added avocado nd it was insanely amazing! Raw or cooked sweet potato??? I was wondering if these taste good cold? I want a cold finger food for a summer lunch function and am new to this site so having a little trouble finding them. Wanted to make this tonight but I don’t have kale on hand. Would fresh parsley work instead? This sounds delish! I don’t have sundried tomatoes or pumpkin seeds though, can you suggest any substitutes? I do have fresh tomatoes! Would sun dried tomatoes not packed in oil be ok if I soak them? Can’t wait to make these! I have made this 2 times, very flavorful. I actually added your sauce from the morrocan burger, the cilantro tahini lime sauce. Perfect, so delicious and very filling. The patties last me the entire work week! I put it in a sandwich or topped on a fresh salad. I just made these and I used chai seeds with water instead of flax. They were yummy!!! I also had my husband eat one with homemade marinara sauce. He really liked it. This recipe is the best. So surprisingly tasty and almost kind of cheesy! These saved me after having my second kid. I made a bunch of these and froze them when I was 40 weeks pregnant and they kept us well fed for awhile. I LOVED IT. I made the cakes tonight, I just wanted to try them and I had them for dinner. Approved! These were tasty and held together much better than I thought they would. I substituted a combo of brown rice flour and almond meal for the oat flour (because I had these on hand and didn’t feel like washing the food processor), substituted walnuts for sunflower seeds (again, because that’s what I had), used probably twice the recommended amount of kale (who knows how much kale will end up one cup after chopping, right? ), and left out the sun-dried tomatoes (didn’t have any) and it was great. This is a great “base” recipe that could be tweaked in infinite ways and probably turn out really good in innumerable well-considered iterations. Thanks!! I just made these with millet (instead of quinoa). Absolutely delicious, and they held together so well. Thanks for the recipe! Glad you enjoyed it, Jennifer! I made these today and I love them. Hard. I used spinach instead of kale and I pulsed everything in my food processor, then I mixed the flour in by hand. Mine took a little longer to bake, possibly because I didn’t drain the oil from the tomatoes? Not sure. So delicious! Do the sunflower seeds need to be raw, or are roasted ok? I’ve made these quinoa cakes several times; they are excellent. Beets are a good substitute for the sweet potato if you happen to be out (as I was today). Pairs well with a green salad and tahini dressing. Thanks for the recipe. Thanks for sharing the substitute info! I’m so glad you enjoy the recipe. Do these taste good cold leftover for lunches, for example? They do, Sarah! I love them straight from the fridge as a snack or quick lunch option. Unfortunately, our family didn’t love this recipe. I thought it was just okay. I followed the recipe as directed but won’t be making it again. I made these today with some substitutions and they were really good! Kids and hubby liked them too. I used shredded carrot in place of sweet potato (only cause I didn’t have sweet potato on hand). When I cooked the quinoa I added dried onion flakes, garlic powder, frozen kale, dried basil, and dried green onion to the pot. For flour I used gluten free oat flour. Lemon juice in place of vinegar. And pumpkin seeds (ground) in place of sun flower seeds. They turned out really tasty! Will definitely be a staple around here! Thanks so much for sharing those great subs, Carolyn!! :) I’m so glad they turned out so well. These were awesome! I didn’t have kale so I used shredded broccoli instead. I also used olives instead of sun dried tomatoes and added some hot Calabrese peppers. My mixture was a bit wet when I was forming the rounds so I was a bit worried how they would turn out after baking, but they came out quite nice. Crispy outside, and a firm but moist inside. So glad those swaps worked out for you, Jason! Sounds like they’d add a great twist on the flavour, too. i think i’m incapable of fully following a recipe, but i really liked what i ended up making! i think i added about a half cup extra kale (overzealously dumped half of the chopped kale in the bowl before measuring), i used fresh rosemary instead of basil and butternut squash instead of sweet potato because that’s what i had available at home, used a bit of fresh tomato and stir fry oil instead of oil-packed sundried tomatoes, used whole oats instead of ground, added an extra clove of garlic, & after tasting, would have added a little more tahini paste, salt, and added a bit of cayenne or jalapeno. but i was really impressed at how well it all worked out and stuck together despite the random substitutions. i ate two tonight on a bun with some homemade honey mustard and froze the rest; excited to try the patties next time with some different sides or sauces next time. i found this recipe on pinterest and am excited to look at what else you have to offer. thanks! I love hearing how my readers have added their own creativity to my recipes, Leah! Thanks so much for sharing, and I’m glad the cakes were enjoyed!! My wife is not a huge fan of quinoa, and she loved this recipe. 5 stars for this one! So happy it won her over, Lisa! I’d like to make this but can I sub the oats ground into flour? Maybe with whole wheat? I’m allergic to oats. Thank you! I’d like to clarify that I’m not gluten intolerant. I’m allergic to oats and I’ve found they’re popular in veggie patties and bars. Is there a grain I can sub with? Thank you! Hi Monica, I haven’t tried this recipe with anything else, so I’m not totally sure! But another type of flour might work—if I remember right, a couple readers have had success with corn flour (I’d suggest skimming back over past comments to see if anyone has reported back on other subs, too). Whatever you try swapping, you may want to add a bit at a time until the mixture is the right consistency for shaping into patties. If you decide to experiment, please report back and let us know how it goes! It looks wonderful but very labor-intensive. From start to finish four hours, including homemade tsaziki sauce will see if it is well received at the Super Bowl party today. Thanks for your recipe. Helllooooo Angela! 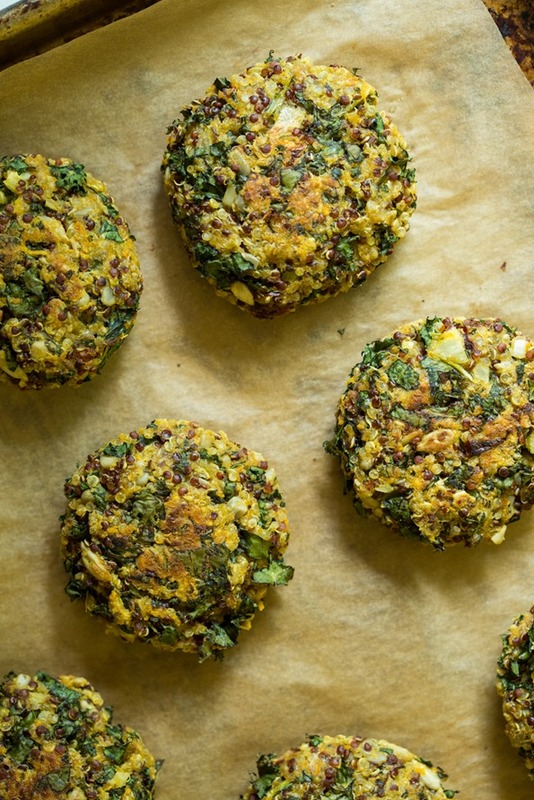 These veggie burgers look awesome! Although I am wanting to cook them for a sweet potato and pumpkin free crowd and I was wondering if you had any substitute ideas? I read someone in the comments used beets instead, although admittedly I find the flavour a little overpowering. Is the sweet potato used for binding or filling or..? Hey there Oliviah, Thanks for your question! I know a number of people have used shredded/grated carrots instead of sweet potato, and really enjoyed the results. So I think that may be a good substitution to try! If you experiment, please let me know how you find the swap works out for you. These were delicious! I doubled the recipe for a family gathering and everyone loved it. Mmmmmmmm! looks so good! 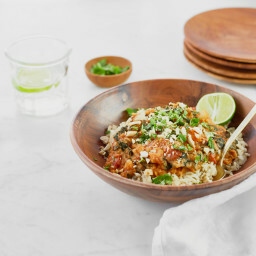 we are making this tonight for dinner!! Check out our blog! lots of good plant based recipes!!! Thanks so much Angela for this recipe which is so versatile…definitely a keeper. I think you could change it up with whatever you have in the fridge and not go wrong! I almost made a special trip to the shops to get some sweet potato but decided not to…so used a small potato (for the starch) and half a carrot (for the sweetness) instead which worked well. I didn’t use the white flour and substituted with a little Besan (chickpea flour) – the patties held together perfectly. We just enjoyed them beside a salad… and some homemade vegan avocado lime mayo to dip them into. Delicious. I made these for Fathers Day breakfast. I substituted grated carrot as I did not have sweet potatoes. I added some diced red peppers and chives for color. My husband enjoyed them. I will definitively make these again. I am wondering how many serves I can get from this ? Hey Bryony, The recipe should yield around 12 quinoa cakes. How many cakes make up an individual serving can really depend on how you’re eating them/what you’re eating them with — and, of course, how hungry you are! We’ve made them accompanied by fries and avocado toast, served them on a salad, tossed them into wraps, slathered them in hummus…the possibilities are endless. Cooked these for the fam with a simple salad, none of us are vegan but one veggo and two boys who love meat but they were a big hit 😊 very pleased with the turn out!! These sound great and I can’t wait to make! I was just wondering if there is a substitute for the red/ white vinegar? This looks amazing! Is there any possible substitute for for red/ white vinegar? I am looking for plant based recipes for my mom to reheat which freeze well and I found this one. Two quick questions: what is the diameter of your veggie patties-thinking of using a mold to help shape them such as a biscuit cutter or English muffin ring-don’t want to make them too thin or thick? Do you have any other suggestions for your most popular plant based recipes which freeze well and are easy to reheat? Thanks for the inspiration! What kind of sauce would you suggest to go with these? holy moly. this turned out SO well. this is one off my new favorite recipes along with your red lentil, kale, and tomato soup. This has been on my list to try for far too long. Finally made and wanted to let you know how much we loved it. So nice to have a change from most veggie patties that use beans. Really loved the flavor combinations. I heated up some leftovers in the toaster oven at work and everyone wanted to know what smelled so good! Thank you! Hey Karen, I’m so glad you enjoyed these so much. I agree they are such a fun change. :) Thanks for letting me know! I’m cooking for a crowd of 29, a few of whom are vegan. Can I prep these the day before and then cook them after storing in the fridge for 24h? Or would you recommend just mixing all the ingredients and forming them right before cooking? Same question for your Bread-Free Stuffing Balls. Hi Will, You can definitely mix and shape the bread-free stuffing balls in advance for 12-24 hours (just tightly wrap up in the fridge to avoid drying out), but I’m not positive about these quinoa cakes are they are a bit drier due to the quinoa. If you try anything I’d love to hear how it goes!